A Welcome to the Village in the Wood! In October, Julie and I made atrip to England. We met a lot of fellow Regia members, many of whom we have never met in person before, and saw a lot of exciting and invigorating scenes—the British Museum, the Victorian English copy of the Bayeux Embroidery, Nottingham Castle, the Jorvik Viking Centre, Bede’s grave at Durham Cathedral, Hadrian’s Wall, Canterbury Cathedral–but one of the reasons we went over was to visit Wychurst, the Village in the Woods, on in its decennial year. Alone of all reenactment societies, Regia Anglorum owns a permanent site. Situated about sixty miles from central London and in a patch of secluded woodland, Regia is constructing a fortified manor house from the Late Anglo-Saxon period. Wychurst is the burgh owned by Regia Anglorum. It sits on three acres in the countryside of England, and the main structure is a wonderful long-hall. It made me proud to be a member of an organization that has been able to construct—and is still working on—this magnificent hall and the surroundings. It is the only building of its kind in Britain. Two acres were purchased in 2000, with a first chance to buy more land as it became available (and it has probably increased by half in the years since), and Kim Siddorn—the founder and executive officer of the society, and whose idea Wychurst first was–related how he traveled through the woods, indicating which tree was to be felled and used in the construction of the long hall. The site was cleared in 2001 and work on the Longhall commenced at Easter the following year. The hall is now finished, with finishing touches such as a mural, tables and a floor being made, and attention is being turned to maintenance and to constructing other structures, such as a home for a forge and for a loom. There is a shipyard with Regia’s six ships, a bee colony—they hope to put them in skeps—and a pond that provides water in case of fire. Regia in Britain hope to put in water and electricity, and the site, which has already been used in several films and documentaries, will probably become the scene for upcoming events and private events. Wychurst is a fortified English manor—properly, a Manorial Burgh. A ditch-and-bank wooden palisade encloses an acre, at the heart of which is the Longhall. It dominates the tree-girt enclosure and the sheer scale of the building just takes your breath away. Mainly paid for by fees gained from events and filmwork, the work has been provided by members of the society themselves, who gen eral show up for work weekends every month. We arrived there on Friday night and met with Kim and others, making friendships and renewing old ones, and on Saturday, we set about work, removing rocks from an ineffective French drain, so that a draining ditch might be dug, nailing down planks for the floors and watching as heavy machinery was used for much else. We toured the grounds, gazing in fascination at the richness. The weather was mostly sunny and wonderful, though some rain fell on Saturday, and the temperatures plunged on Sunday. 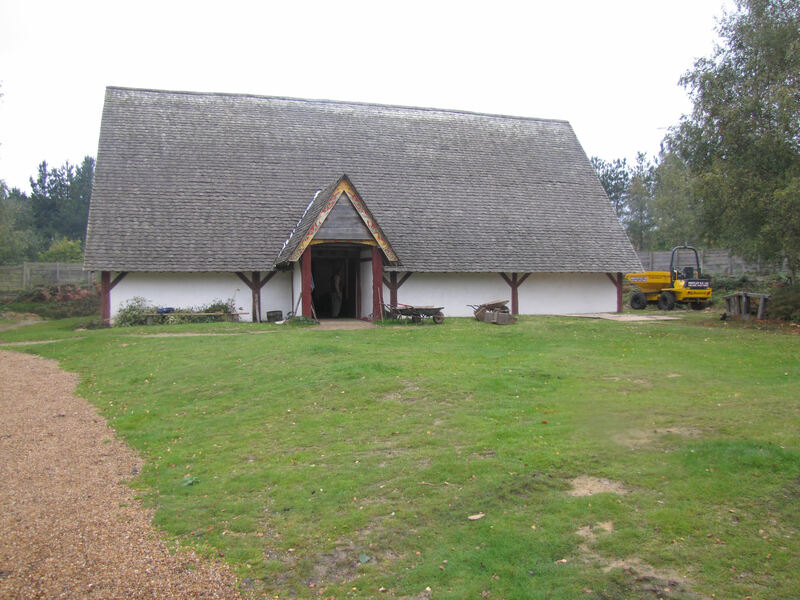 The Regia land is entered through a gate that leads past a storage shed, which was the first building fabricated on the site as a trial run for the wattle and daub construction that was later used for part of the hall. There is a ring road around the palisade, leading past a parking lot, the pond, the bee hives and the shipyard. The wall is placed atop a terraced bank, and there are gates to the front and to the back. The hall itself–large and formidable—has tall ceilings, wooden beams and a firebox in the center. A mural is started on the wall, and there are risers on either side of the hall where the important may sit. Right now, one end is filled with material needed for construction an scaffolding for repairing leaks in the roof, and modern seats are used as well as period benches and other seats. There is no glass in the windows at the eves, just shutters, and the pillars in the hall each contains metal lamps which may be lit and pulled on chains. On Saturday night, we sat around the fire in the hall and told stories, sang and debated the fine points of reenacting. We left on Sunday afternoon—Wychurst coordinator, Alan Tidy, was kind enough to drive us to Heathrow—but we left in a happy afterglow. We had been dazzled by the hall ever since we first saw photos, and it was truly a pilgrimage to get to the site. And so when we arrived at the hall, it was indeed a religious experience! Vivat Regia Anglorum! This entry was posted on April 4, 2011 by folo1. It was filed under Uncategorized .